And thank you so much for reading a farmgirl’s dabbles! At the end of each December, when people start talking about what they’ll be eating to celebrate the new year, I can’t help but think of Potstickers. These little dumplings are considered a lucky food to eat during Chinese New Year celebrations. I also happen to find them irresistible (any time of year), and am more than happy to adopt them into my own culture as well! Potstickers are dumplings that are usually filled with meat and cabbage, wrapped in a thin dough, and then pan-fried and steamed. They are tender flavorful bites, enjoyed with a tangy soy dipping sauce. It’s been many years since I made my own potstickers by hand, as I often opt for the ones I can so easily pick up at Trader Joe’s. Pre-kids, potsticker making was a pretty regular activity for me. So, yes, I am saying they are a bit time consuming. Definitely not a quick weekday meal. But…they are also fun and satisfying to make, and worth the effort when you’re up for some kitchen adventure. 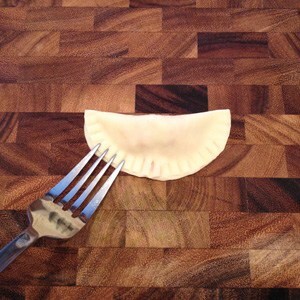 I do save some time by using pre-made potsticker wrappers and a quick and easy method of crimping the dough with a fork, rather than creating the beautiful artistic pleats that you might see from your local authentic Chinese restaurant. Another time saver…I always make a double batch and freeze the extras for a future day. Once you get on a roll with making the potstickers, it’s really not that much more work to just double the recipe. 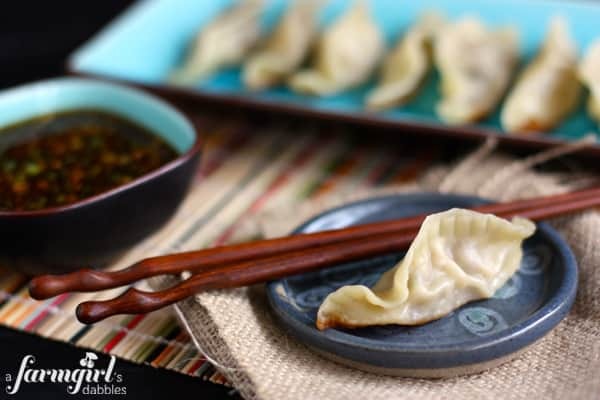 Potstickers make for a fun appetizer, and oftentimes are served as a main dish around here. My whole family loves them. In a medium bowl, mix together the pork, cabbage, green onion, garlic, ginger, rice vinegar, oyster sauce, cornstarch, and black pepper. 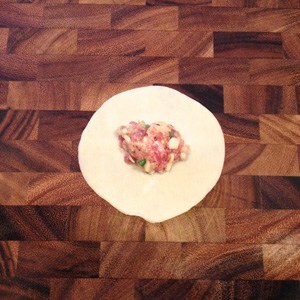 Place a rounded teaspoon of pork mixture onto the center of a potsticker wrapper. Have a small bowl of water near and dip your finger into it. Run your wet finger around the outer perimeter of the potsticker wrapper. Fold the wrapper over the pork mixture to form a half-moon. Then seal the edges with a fork, using firm but gentle pressure. 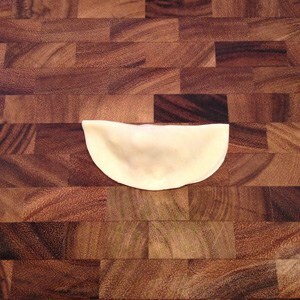 On a tray dusted with cornstarch, set filled potsticker down firmly, seam side up, so that it will sit flat. Repeat process with remaining potstickers. In a large, deep skillet, heat 1 tablespoon of oil over medium-high heat. Swirl the oil to evenly coat the bottom of the pan. Add half the potstickers (do not overcrowd – if your pan is not big enough to hold half the potstickers comfortably, then split them into 3 batches instead), seam side up, and cook until bottoms are golden brown, about 3 to 4 minutes. Add 1/3 cup of chicken broth, then reduce heat to low and cover the pan. Cook until potstickers are tender and liquid has evaporated, about 6 to 8 minutes. Remove to serving platter and repeat the cooking process with the remaining potstickers. Serve hot with dipping sauce. In a small bowl, stir together all dipping sauce ingredients. Note: Because potstickers can be time consuming to make, I always double the recipe and freeze half of them. To freeze, simply spread potstickers on a pan dusted with cornstarch, and then cover with foil. Once they are frozen, transfer them to a freezer safe container or baggie. To cook, take them directly from the freezer into the pan, and increase the cooking time by about 2 minutes. net. Disgrace on the search engines for not positioning this submit upper! Great post and awesome pictures! 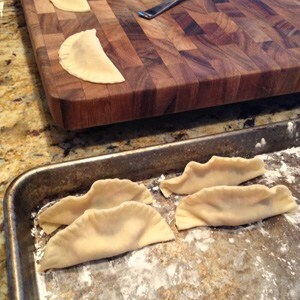 I just made pork pot stickers myself and it’s fun to see someone else’s recipe. And I’m always looking for new dipping sauce recipes. Thanks! I love potstickers, but it has been forever since I have made them at home! Pinning this, so I can make them soon! This probably doesn’t come as a surprise to you, but I’ve never had potstickers xD They look very interesting though. I’m assuming you can switch the pork out for beef or chicken, right? Anyways, I’ll have to keep this recipe in mind for when I’m feeling adventurous in the kitchen. Happy New Year, Becca! Yes, the pork can be swapped out, or completely left out for a vegetarian dumpling. Hey Brenda! This recipe looks so tasty! Quick question, after you steam the first batch, do you need to clean out the pan before the next batch? Thanks! Hi Jennifer! No need to clean out the pan in between batches. Hope you like this! This probably won’t surprise you, but I’ve never had potstickers, haha. These do look very interesting. I’m going to have to remember this recipe for when I’m feeling adventurous. I hope you had a lovely Christmas and I hope you’re having a good new year! I am definitely going to be making these this week!!! Yummy! I’ve never made these from scratch, I usually just buy the frozen variety. Maybe I should make the “real thing” sometime! 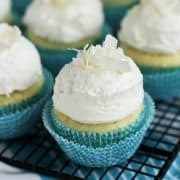 These look so delicious! I love potstickers and have never made them on my own, but your recipe looks fantastic! I love the classic dipping sauce you typically get at a restaurant with potstickers and yours looks so flavorful! Happy New Year to you and the family Brenda! All the best in 2013 for all of you. I can’t say that I’ve ever eaten a pot sticker but when I saw the first picture they made me think of won tons. 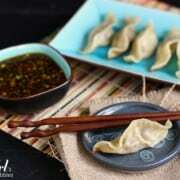 Then I saw that you can use won ton wrappers to make them. I think are are quite similar to won tons are they, except that they are cooked differently? 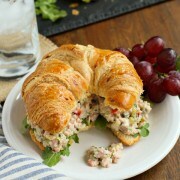 In any case, they look wonderful and a great appetizer for any celebration. You’re completely right, Paula. They have the same basic makeup, but wontons are usually boiled or deep fried, and potstickers are pan seared and then steamed. And I love them ALL!! :) Happiest New Year to you and your family, Paula! 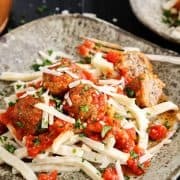 These look absolutely amazing and delicious!!! Thanks so much for sharing, Brenda! Happy New Year. I could seriously eat 2 dozen of these by myself. Happy New Year sweets. We love potstickers but have never made them. These look delicious so maybe we’ll give them a try this weekend. Hi Rachel – please let me know if you try these! 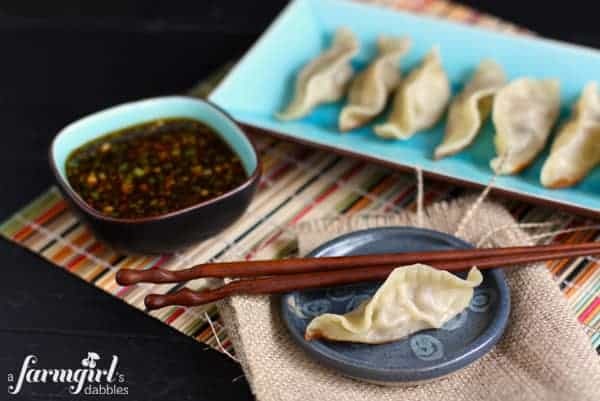 Can’t wait to try these – I LOVE potstickers!!! I remember when you made these for you us, and would love to have some again. We love potstickers, too! Happy New Year, Brenda! Happiest New Year to you and your family, Robyn! How awesome! I bet you have so many wonderful memories from your travels. Can you believe I’ve never ate potstickers? I must try these soon! If I had my way, I would eat potstickers (well, and sushi too) every day of the year. These look fantastic, Brenda! Happy New Year to you and your family! I’m pretty sure I could survive on them, too! Thanks, Dara – and Happiest New Year to you and your fam! I’ve never heard that about potstickers being good luck! I’ve always wanted to try making my own though. Why can’t we be neighbors!?!? These look incredible…they are a favorite of mine! I love potstickers and often have a bag from TJ’s in the freezer. I’ll have to try making my own. Happy New Year! Thank you so much for sharing your recipe. I’ve been looking for a good pot sticker and dipping sauce recipe for some time now and this one looks pretty terrific. Can’t wait to try it. Happy New Year! You’re welcome – hope you like it! Happy New Year!